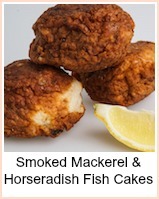 These fish cakes are made using canned fish. 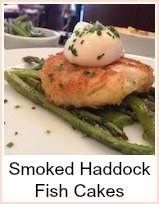 You can use leftover or freshly cooked mash and/or fish to make them if you prefer. 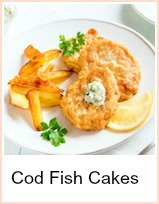 It's really simple and is a good way of getting children to eat fish - real comfort food. You need to have all your ingredients pre-cooked, so it's something you can prepare early and assemble just before cooking. Pop them into the fridge to chill for a while - even all day if you like. I will often have bits of mash or fish left over, so I put them into poly boxes in the freezer, then when I have enough, I defrost and mix it together. You can use any fish you like - plain or smoked or a mixture - add a few prawns - even a tin of salmon, tuna or pilchards will do. Make breadcrumbs by processing a couple of slices of bread. Or you can dry bread in the oven and crush it in a poly bag to stop the bits escaping. If you prefer, you can use seasoned flour to dip the cakes in prior to cooking. Just take a couple of tablespoons of plain flour and add some pepper and salt (if you're using smoked fish, then don't use the salt) add a teaspoon of dill or parsley if you like, then mix it together evenly. Make sure you have removed all the bones from the fish prior to flaking it into a big bowl. Add the mash and dill and mix together well - taste and season with salt and pepper if necessary. Divide the fish into 4 or 8 and shape into balls and then flatten them gently. Dip into milk and then roll in the breadcrumbs, making sure they are fully coated. Heat the oil in a large shallow pan and fry each side for about 10 minutes. You can bake them in a hot oven (220c Gas Mark 7) for about 30 minutes, turning half way through if you prefer. Seve with some green vegetables and bread and butter or some boiled new potatoes. 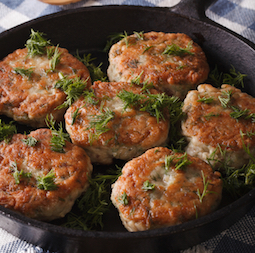 Fish cakes are a fabulous way to use up small amounts of left over fish, smoked or plain or you could use canned as in this recipe. Kids love them - so do big kids!